At Cantey Foundation Specialists, we specialize in crawl space problems of all types. We offer free crawl space repair quotes in the South Carolina area, including areas like Augusta. We also provide crawl space repair in the Augusta, GA area. 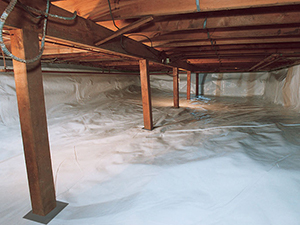 Get a FREE Crawl Space Encapsulation Quote Today! Allison M. just bought her home in Camden, SC and is excited to be a first-time homeowner. She has dreamed of finally owning a home and there was no better place than her hometown to have one. She knew it would need some repairs so she started with the foundation and crawl space. Allison's dad always taught her that the foundation and crawl space of a home needed to be taken care of. Allison knew of a company in town called Cantey Foundation Specialists and that they provided free inspections. She gave them a call and made an appointment with System Design Specialist Chip Baxter. When Chip arrived he did a thorough inspection before sitting down with Allison. He explained to her that her crawl space had some moisture damage. This damage would only get worse unless she did something to prevent it. Cantey's CleanSpace system could help her protect her home. The CleanSpace system would begin with the floor, walls, and piers being wrapped or covered in a thick material. This material would separate the home and crawl space from the ground and moisture. The material is then secured with spray foam adhesive to create a complete barrier. This barrier would keep the crawl space dry and prevent further damage from moisture. Allison knew she needed to protect her new home so she scheduled the installation. Production Crew Leader Estevan Lopez, Production Crew Member Jonathan Whitaker, and Production Crew Member Phillip Sullivan came out and effectively installed the CleanSpace system. Allison is glad she worked with Cantey to improve her home and allow her to move forward with other home renovations. After the flood, Julia R. from Camden called Cantey Foundation Specialists with a whole array of problems. The first project? Draining her crawl space of any water, decreasing the humidity so living organisms would not grow, stabilizing her floor through our SmartJack system, and encapsulating her whole crawl space to prevent further damage of rotting or mold. Jarret N. of Ridgeway, SC had concerns about his crawl space; he noticed mold growth and moisture issues throughout the area, and he was worried that it would start affecting his foundation. After calling Cantey Foundation Specialists for a free estimate, System Design Specialist James Davis explained to Jarret that the best solution to his problems is to completely encapsulate the crawl space with our CleanSpace system. The production crew led by Foreman Matt Garcia began the installation by removing all the insulation and correctly grading the soil in the crawl space. Next, they installed a SumpPump to ensure that any water would be pumped away from the home. Lastly, they covered the entire crawl space in a thick vapor barrier, which will keep moisture levels low enough to stop and prevent any future mold growth. At Cantey Foundation Specialists we use and recommend products developed by the Basement Systems® International network of waterproofing contractors. In business since 1987, Basement Systems® operates a full Research and Development department, constantly searching the industry for the best, most proven products for lasting crawl space solutions. Your free crawl space repair quote includes an on-site inspection, professional consultation, and written quote. Before your free quote, we'll also send you a copy of our full-color Crawl Space Science Book. Our book includes 88 pages of information on crawl space issues, how they're solved, and what our products can do for you. Call or e-mail us today to get started with a vapor barrier, thermal insulation, or solution that works for you!